I wish every artist who follows my blog could join me for my live workshops. 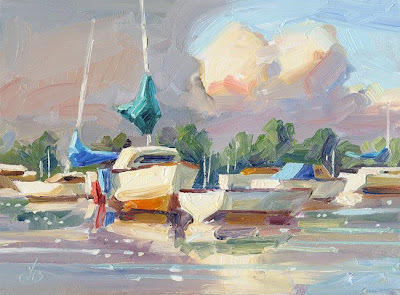 We always have a great time, and even first-time artists discover how easy it is to paint if you have good instruction. If you can’t join me in person, check out my CDs and DVDs. Each CD is like a “book on your computer.” You can even print them out for handy reference. They are designed for every artist from the complete beginner to the seasoned professional. My DVDs are videos of TV shows where I am filmed in real time, painting on location. You look over my shoulder as I create a number of paintings under different conditions. Each DVD is $30, or you can get the full set of 4 for just $100. If you are going to get just one, I suggest “BACK BAY” where I show you how to make an outdoor painting kit that is virtually free. Email me for more details. tombrownstudio@cox.net. 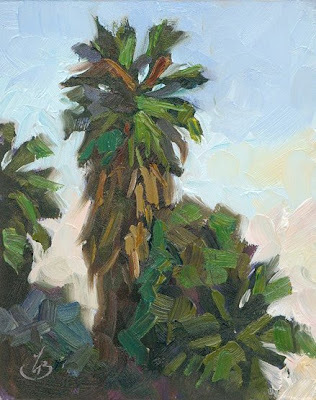 I often create small studies like this as preparation for larger paintings. 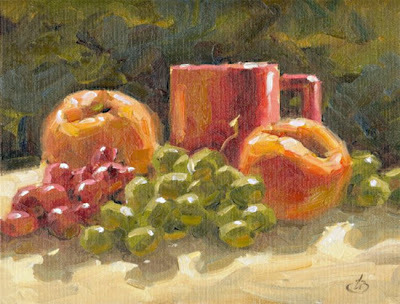 Despite their size, these little gems capture the true energy and excitement of the composition, and they are very satisfying to paint. This is a unique opportunity to own an original piece of my work at a very affordable price. 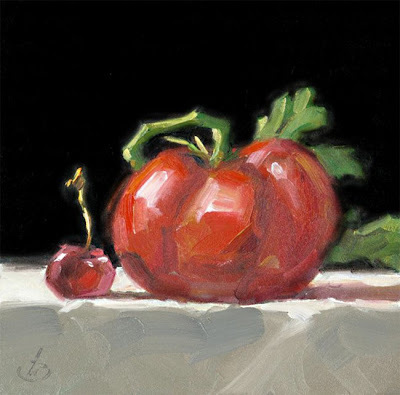 I offer these small paintings online as a way to introduce my work to new collectors. I also paint in larger sizes on commission, and welcome inquiries. 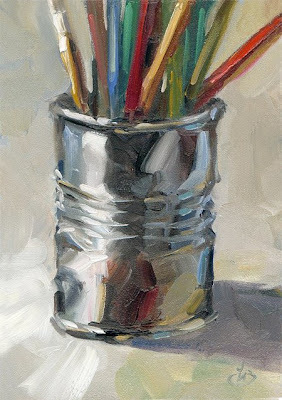 I keep my studio brushes in a variety of old tin cans, jars and mugs. I especially like the cans with the ridges in the center. I enjoy the way they catch light and reflect other things in the studio. I have painted some of them in the past, and today this one caught my eye and politely asked to be immortalized. Enjoy! This abandoned structure from a bygone day stands on the site of the original Irvine Agricultural Center in Southern California. This is one ancient of the buildings that housed itinerant field workers who tended the land long ago. The windows and doors are now boarded up and the buildings have a sad, forlorn look. If you are interested in this painting, email for details at tombrownstudio@cox.net. Thanks for looking. 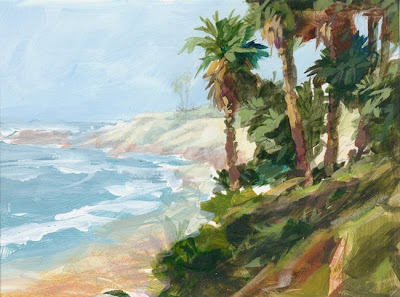 This is a small study of the cliffs in Laguna Beach, painted from the Gazebo near Las Brisas restaurant. A light fog veiled the distant cliffs and muted the colors of the landscape. The fog softened the noises of the gulls and gave the scene a very tranquil feeling. Hope you like it. I always welcome comments. tombrownstudio@cox.net. Thanks for looking. Our son recently graduated college and is now moving out of state to accept a new job. Packing materials like this are everywhere in our home at the moment as we help him prepare for the move. Among all the temporary clutter, these spools of twine caught my eye and I paused a moment to capture this in oils. I feel a subject doesn’t need to be complex to be interesting. 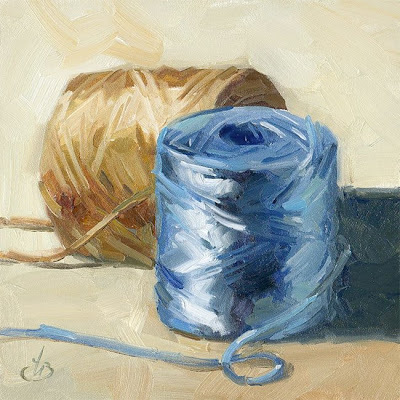 I especially liked the way the light shimmered on the spool of blue nylon twine. If you wish to purchase this painting, email me at: tombrownstudio@cox.net. Thanks for looking. 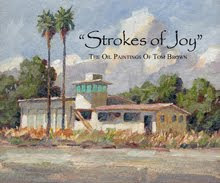 If you’re in the Orange County area stop by and view my new show of work in Laguna Beach. 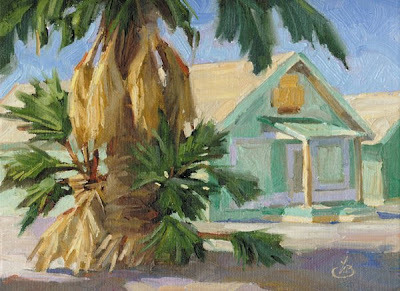 The gallery address is: ARTIST EYE LAGUNA GALLERY, 1294 S. Coast Highway, Laguna Beach, CA. Email me for additional details: tombrownstudio@cox.net. Thanks for looking. It was a mild day in the countryside with feather-soft clouds floating in clean, fresh air. 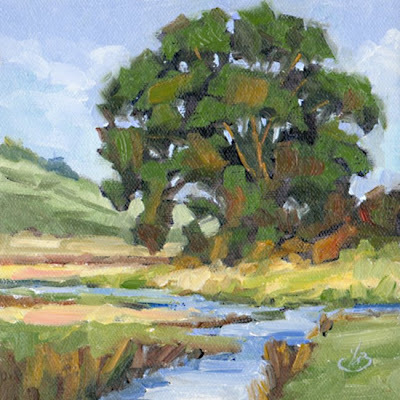 The silent stream added a note of peace and serenity to the moment, and made me open my paintbox to capture the feelings on canvas. Hope you like it. If you would like to try your hand at oil painting, check out my series of CDs and DVDs that will get you started right. They show how anyone can paint well on their first try. The DVDs are episodes from my TV shows where I am filmed live on location painting the scenes in front of us. The CDs are “e-books” that you can use on your computer or print out for reference. Email me for details if you’re interested. tombrownstudio@cox.net. If you’re in the Orange County area stop and view my new show of work in Laguna Beach. 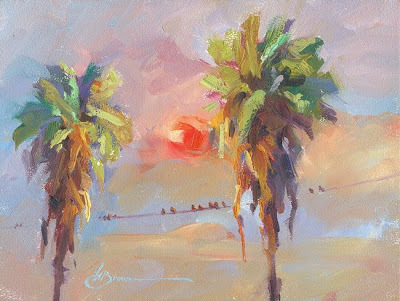 The gallery address is: ARTIST EYE LAGUNA GALLERY, 1294 S. Coast Highway, Laguna Beach, CA. Email me for additional details: tombrownstudio@cox.net. This was a quick study done from the front seat of my car. I wanted to capture the essence of the scene and felt a camera wouldn’t get the feeling I wanted. 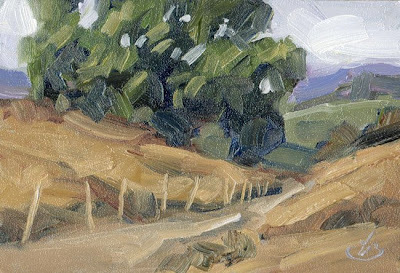 I had pulled the car to the side of the road and did this little study on a piece of card stock, while on a road trip to somewhere else. Today I decided to share it on my blog. Hope you like the view. A new show of my work just opened in Laguna Beach, and the gallery is featuring my work all month in the front window. 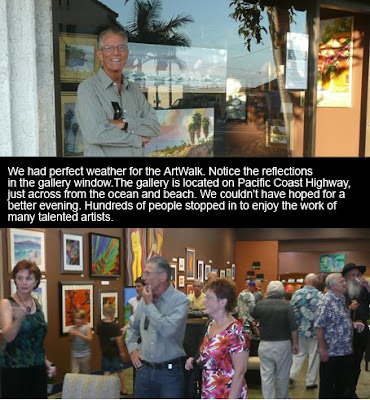 On Thursday the gallery was on the list of places to see during the ArtWalk, held each month in Laguna Beach. If you missed it, please feel free to stop in any time you’re in the area. The address is: ARTIST EYE LAGUNA GALLERY, 1294 S. Coast Highway, Laguna Beach, CA. Email me for additional details: tombrownstudio@cox.net. A quick note to all my loyal fans: come see my showing of new works if you’re in the Laguna Beach area. I am the gallery’s featured artist this month, with my work displayed in the gallery window. The address is: ARTIST EYE LAGUNA GALLERY, 1294 S. Coast Highway, Laguna Beach, CA. Email me for additional details: tombrownstudio@cox.net. I’ve been busy! A new show of my work just opened in Laguna Beach. I am the gallery’s featured artist this month, with my work displayed in the gallery window. Stop by if you’re in the area. The address is: ARTIST EYE LAGUNA GALLERY, 1294 S. Coast Highway, Laguna Beach, CA. Email me for additional details: tombrownstudio@cox.net. 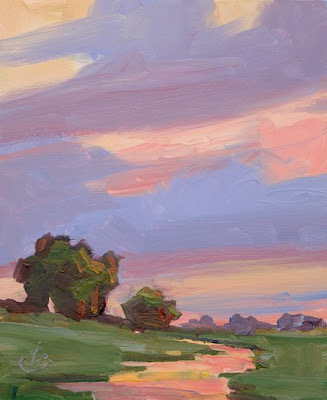 I am also teaching two oil painting workshops, both of which have full enrollment. 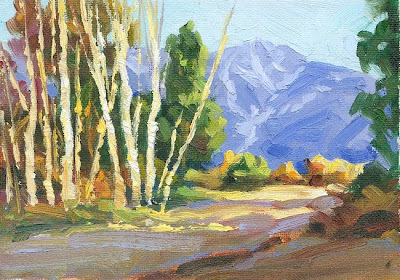 One is a studio workshop and the other is a Plein Air workshop during which we meet on location at a new spot each Saturday morning to paint directly from nature. I wish all my faithful blog viewers could join me for these classes. We always have a great time painting and meet new friends with common interests. 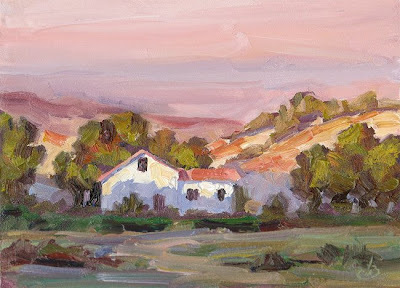 Even first-time artists are surprised to discover how easy it is to paint if you know what to do. If you would like to try your hand at oil painting, I have a series of CDs and DVDs that will get you started right. They show how anyone can paint well on their first try. The DVDs are episodes from my TV shows where I am filmed live on location painting the scenes in front of us. The CDs are “e-books” that you can use on your computer or print out for reference. Email me for details if you’re interested. tombrownstudio@cox.net. A quick note to all my loyal fans: come see my showing of new works if you’re in the Laguna Beach area. I am the gallery’s featured artist this month, with my work displayed in the gallery window. The address is: ARTIST EYE LAGUNA GALLERY, 1294 S. Coast Highway, Laguna Beach, CA. Email me for additional details: tombrownstudio@cox.net. 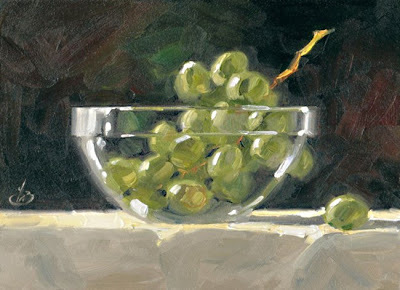 This is a companion piece to the still life shown yesterday. 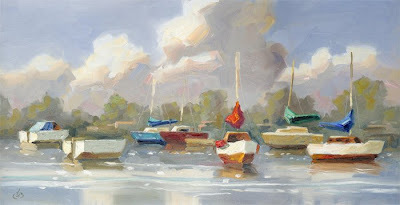 It was painted during the same workshop, outdoors in direct sunlight. Come see my showing of new works if you’re in the Laguna Beach area. I am the featured artist this month, with my work displayed in the gallery window. The address is: ARTIST EYE LAGUNA GALLERY, 1294 S. Coast Highway, Laguna Beach, CA. Email me for additional details: tombrownstudio@cox.net. 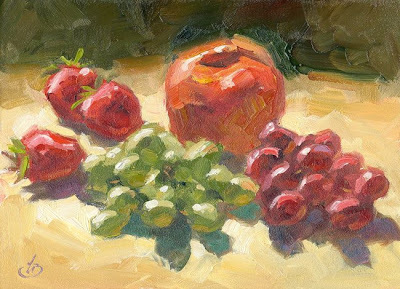 This is one of a series of still life compositions I painted outdoors in direct sunlight. The natural light brings out the beautiful colors in the fresh fruit. 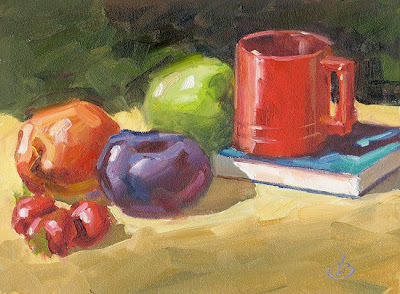 During my most recent plein air workshop I had my students paint still life compositions like this outdoors in the open air. For subject matter I brought a huge selection of fresh fruit from the local farmer’s market. I also brought coffee mugs, flowers, books and other objects to use. 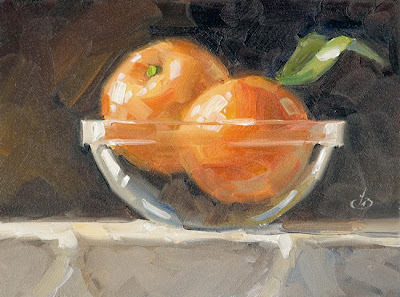 We had a great time capturing the freshness of summer sunlight on these subjects in our paintings. 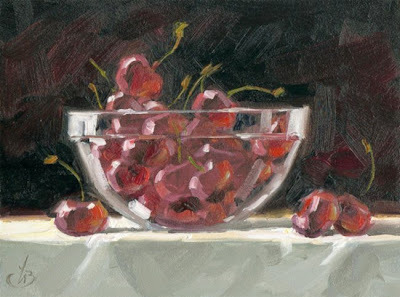 This is one of the demonstration paintings I did for the students, showing how I approach composition, block-in, color balance, brushwork and other elements of painting. I hope you like it. If you would like to try your hand at oil painting, I have a series of CDs and DVDs that show how anyone can paint well on their first try. The DVDs are episodes from my TV shows where I am filmed live on location painting the scenes in front of us. The CDs are “e-books” that you can use on your computer or print out for reference. Email me for details if you’re interested. tombrownstudio@cox.net. 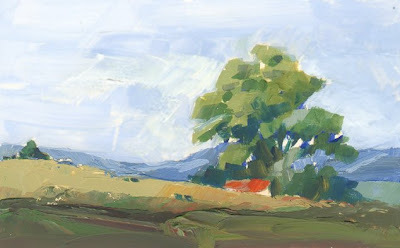 This is a demonstration painting I did for my students at a recent Plein Air Workshop. I wish all my faithful blog viewers could join me for these Workshops. We always have a great time painting and meet new friends with common interests. 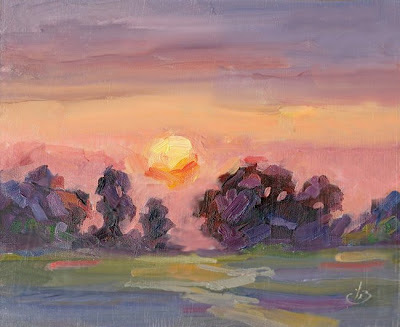 Even first-time artists are surprised to discover how easy and fun it is to paint if you know what to do. For those who can’t join me in person, I have CDs and DVDs that show how anyone can paint well on their first try. The DVDs are episodes from my TV shows where I am filmed live on location painting the scenes in front of us. Email me for details if you’re interested. tombrownstudio@cox.net.